The Zodiac Sign Cancer Man (June 22 - July 22), Cancer Personality Traits for Male born under June Zodiac signs. The Cancer man is very secretive with regards to his inner world. He strives to protect it by all means and often wears a mask behind which he successfully hides from others. This representative of the zodiacal circle is very suspicious, he does not immediately come close to his interlocutors, preferring first to consider and study them from the side. It is very difficult to understand the character of this man because he always tries to get away from view, and better hides behind many masks that are in abundance in his arsenal. The Cancer man has a subtle vulnerable soul but his manners are often rude because Cancer sees a demonstration of delicacy and tenderness as a demonstration of weakness - and he cannot tolerate such a thing. The Cancer man is careful person, he moves ahead only when he feels the safety of his path. At the slightest change in a situation, he backs up and dissociates himself from that affair. Therefore, Cancer man is very often regarded as a coward. Even his own emotions haunt him, and he may severely suffer from surging emotions or from his own sentimentality. His mood is often pessimistic, he suffers from discouragement, depression and melancholy, but sometimes it hits the other extreme, and his cheerful euphoria with somersaults may enter into a stupor of anybody. The Cancer man is a great possessor and always feels fear of losing something important in his life, even without specific prerequisites for this. He is always afraid of material instability and therefore seeks to provide himself and his family for all the foreseeable future. Life with this partner will be free of major financial problems and difficulties because the Cancer man knows and loves to make money, and as well knows how to save and spend wisely, while he cannot be called a spendthrift or greedy person. Very often, the Cancer man plays the role of an underprivileged and poor person, he tries to play down his income and not to tell others about his amount of savings because he is afraid of jealousy or attack on his precious budget. But in his life, the Cancer man still prefers not to economize on the quality of things because he believes that cheap and poorly made stuff does not help in saving, but durable, strong and comfortable things can serve him more than one year and, consequently, save spending in the future. Cancer man tends to always look stylish and fit, he cannot tolerate disorder or uncertainty in his life, and tries to always arrange everything accordingly. He always feels a great affection for home and family, and if he still lived with his mother, he will then agree to raise up his own family and, consequently, his own home, only if he is convinced of the seriousness of the partner to devote herself to the family and to him. 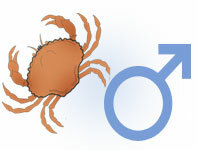 Cancer man looks for a maternal care in love and in personal relationship with a partner. It would be very grateful if his fiancee will be a good housekeeper, will not waste money for nothing and will care for him when he is sick, or just when he another bout of melancholy begins. Inside the heart, the Cancer man always remains a small child because as a child, typically he was very attached to his mother, and therefore expects motherliness from his beloved woman. This representative of the zodiacal circle is very gallant, he would be happy to care for a woman and to give her signs of attention. A relationship with a Cancer man will always be full of sensual romance and tenderness. How can they be romantic with a motherly woman that they look for in their beloved ? Strange ! Don’t they feel motherly love for them then ? Full description of Cancer Man, character traits and personality characteristic for male Cancer.